When I lived in Vancouver in the early 1970s, Boxing Day, the day after Christmas, was not the Canadian "Black Friday" (bargain shopping) that it has since become. Instead, Boxing Day was dedicated to visiting friends and coworkers or colleagues, while Christmas was reserved for spending time with the family. Some people held open houses on Boxing Day, others spent the day moving around from home to home. 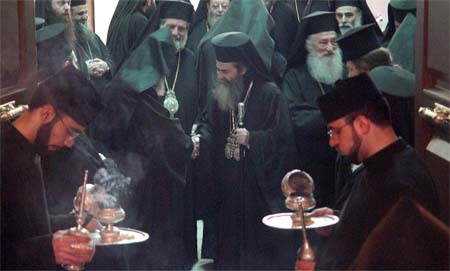 On Tuesday, his Beatitude Theofilos III, the Greek Orthodox Patriarch of Jerusalem (pictured here and above) and his brethren held open house at the Greek Patriarchate. Today, it was the turn of the Armenian Patriarch and the Monastic Brotherhood here to receive the ecumenical deligations. 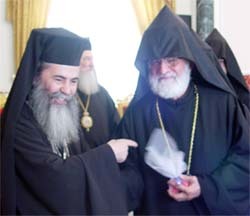 Here we see the Greek Patriarch with his old friend and former colleague, Fr. Samuel. One year ago, his Beatitude was a simple priest representing the Greeks on the ecumenical triumvirate that governs the great basilica church of the Resurrection. 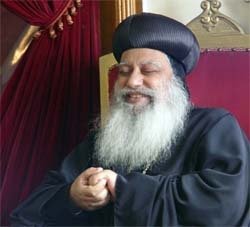 I'm told the new Patriarch was appointed about 7 or 8 months ago. His predecessor, Patriarch Irineos I was removed from office because, Haaretz reports, "he was suspected of selling strategic church properties in the Old City to right wing Israeli groups or individuals." 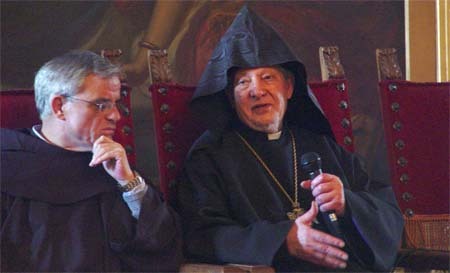 Controversy has arisen mainly because the Israeli government continues to recognize Irineos as patriarch, despite the legitimate process of his replacement. Haaretz reports that the Israeli Minister Tzachi Hanegbi, the chairman of a ministerial committee created to deal with issues surrounding the Greek Orthodox Patriarchate, insists that "Israel cannot support the [former] Patriarch's removal precisely because the pretext for his dismissal was the sale of property in Jerusalem to Israelis." This controversy and Saturday's incidents involving the Israeli police (blocking access to the Church of the Resurrection and detaining four Armenian boy scouts) are stirring up the now perennial debate about who should govern the old city. 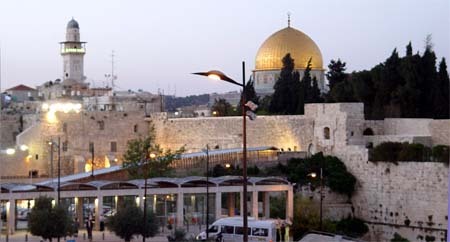 It is the position of the major Christian communities of the city that the Israelis are too biased by their own self interests, in their management of Old Jerusalem, and that Jerusalem should become an autonomous region, like the Vatican City, and be governed by the United Nations or some other neutral authority. Today it was the the turn for his Beatitude Torkom I, Armenian Patriarch of Jerusalem, and his brethren to hold open house; and the Greek Orthodox were the first of three visits scheduled this morning. Two deacons holding incense burners stand at the entrance to the Patriarch's residence. They also hold silver containers designed for the sprinkling of rose water into the hands of honoured guests. 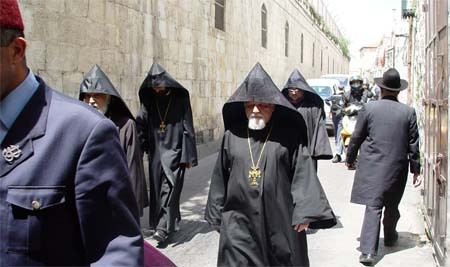 Soon after the visit from the Greek Orthodox, it's time for an ecumenical group of Christian neighbours in Old Jerusalem to visit the Armenian Patriarchate. 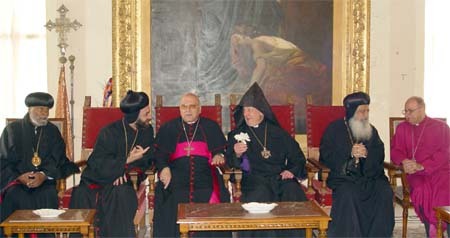 Pictured here in order, left to right, the Ethiopian and Syrian Archbishops, the Latin Patriarch (Roman Catholic), the Armenian Patriarch, the Coptic Archbishop, and the Anglican Bishop of Jerusalem. Representatives of the Lutheran community (both German and American) and leaders of the various Roman Catholic communities (Benedictines, Assumptionists, etc.) are also in this group of visitors. The Ethiopian Archbishop represents one of the humblest communities in Jerusalem, the Ethiopians are the poor cousins of the Christian communities here. Living in relative squalor on the roof of the basilica of the Resurrection, the Ethiopians seem like time travellers from an entirely other epoch, one of monastic austerity and an intensly spiritual focus. Also in the ecumenical group of visitors, Pastor Russell Siler and a Lutheran colleague, pictured here with the Revd. 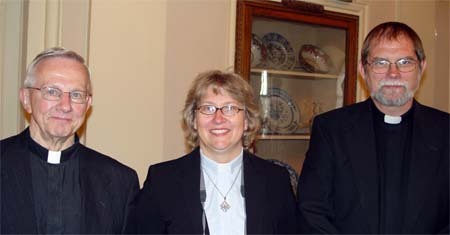 Chris Ferguson (right), a minister from the United Church of Canada who has been seconded to the Jerusalem office of the World Council of Churches -- he once served in the ecumenical ministry of the Saguenay, Quebec, and is a good friend of the former and current United Church ministers in Quebec City, Martyn Sadler and George MacDonald. No sooner has the ecumenical contingent gone its way and it is time for the third and last group of visitors this morning, the Franciscans. They come separately, as have the Greeks, because of the importance of this community in the pilgrim economy of Jerusalem Christianity. The Franciscans have had responsibility for managing many of the pilgrimage sites throughout the region since the time St. Francis himself visited the Holy Land, impressing the Sultan of the day with his spiritual integrity and gaining access to the Holy Land for pilgrims from Europe -- access which had previously been blocked for centuries under Moslem rule of the Holy Land. 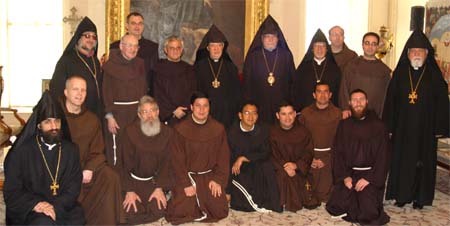 Thus it is that a member of the Franciscan community serves with representatives of the Armenian and Greek orthodox on the triumvirate that governs the basilica of the Resurrection. There is a set routine for each of the visits. First the leader or pre-eminent churchman in the group of visitors (the Latin Patriarch in the case of the Ecumenical group), offers a few words of greeting, setting the visit in the context of the great feast of the Resurrection and our shared salvation in the risen Lord Jesus. Then the host replies with a similar statement. His Beatitude Torkom I, Armenian Patriarch of Jerusalem, takes this opportunity to brief the ecumenical community on the incidents that compromised the success of the Holy Fire ceremony on Saturday. Click here to listen to the Patriarch's brief address (about five minutes), the simplicity of which causes the Latin Patriarch to acknowledge Patriarch Torkom's skill as a homeliest. The talk essentially reviews the information reported in my post Holy Fire! For a shorter recording (one minute), if you prefer, with only the conclusion of his Beatitude's remarks, click here. There is time for a quick lunch (20 minutes approximately) before a small group from the brotherhood of the Armenian Patriarchate leave the monastery to walk through the laneways of the old city to return the visit of the Coptic community. 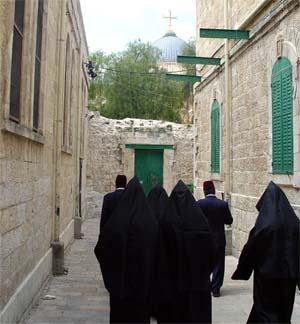 The Coptic Patriarchate is next door to the basilica of the Resurrection, at the ninth station of the Way of the Cross in Old Jerusalem; and the main door to the Coptic Patriarchate is just across the way from the roof top monastery of the Ethiopian Orthodox. 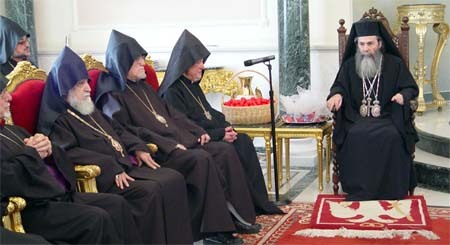 Archbishop Abraham, second from the right, welcomes us and an Arabic speaking bishop leads the small group of Armenian visitors and their Anglican guest. 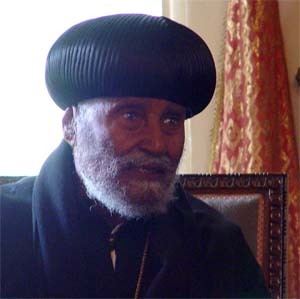 The centre throne, pictured above, is probably reserved for his Holiness Pope Shenouda, Holy Father of the Coptic Orthodox and Patriarch of Alexandria, Egypt. The gathering here is smaller and more convivial than any of the previous ecumenical visitations. 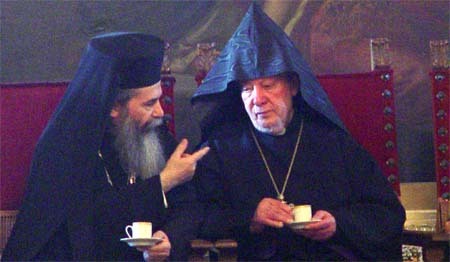 The Armenian bishop has a wild sense of humour, much to the delight of his Coptic host. At one point, there is a show-and-tell discussion about the headgear worn by the two prelates; and Archbishop Abraham explains that his round hat contains, as it were, the troubles and preoccupations of his people. This leads to a discussion of the sorry events of the previous week in Egypt when a mentally deranged Moslem attacked a couple of Coptic churches, killing one and wounding many others with the sword he was brandishing. The Armenian reflects that while governments are cause for worry in the Middle East, crazy fanatics are less worrisome -- a view not entirely shared by his Coptic host! On the return trip to the Armenian Patriarchate, I wonder whether this will be the last time the streets will be closed for one of our official walks, during what remains of my stay with the Armenians here. The press of the traffic behind us is particularly insistent this afternoon, some of the drivers seem to think that leaning on their horns will speed us along our way, but the effect seems quite the opposite! 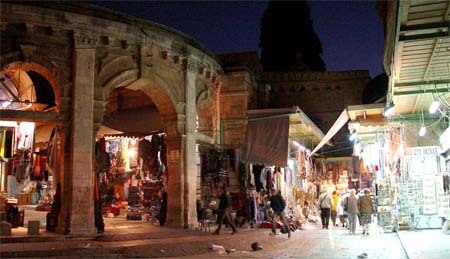 In the evening, it is just too nice to stay closed up in my quarters at the monastery; and I head out to visit the Wailing Wall in the south east corner of Old Jerusalem. The wall is the western side of the great temple platform erected by King Herod the Great, made infamous in the Christmas story for having ordered the slaughter of the Holy Innocents in an attempt to assassinate the baby Jesus. 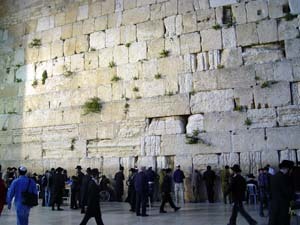 The western wall supported the Devir, the most sacred chamber of the temple, the Holiest of Holies; and it is thus the holiest site in Judaism today. I too find it is a very powerful place to pray. My black cassock draws very little attention, as I approach the wall and place my piece of paper, with the names of people I have been asked to hold in prayer, in one of the many cracks between the great stones of the wall. 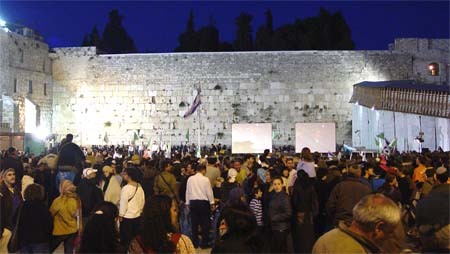 A very large crowd, perhaps a couple of thousand of Israelis have gathered in the wide public square beside the wall. The atmosphere of this predominantly youthful gathering first suggest the possibility of an evening rock concert, but it appears instead to be some sort of induction ceremony for a hundred or so of the newest recruits in the Israeli militia. Such a curious blend of cultures and customs on this Boxing Day after Easter in Old Jerusalem.